I decided to spend a few hours on Stetho. It is very simple to enable Stetho. In my simple application, I have a network call with okhttp-client , a simple value in the shared preferences, and a small db with one table. Now the last step: Run the application and just open Chrome on your pc (where the device is plugged). Here you can open a magical world...clicking the inspect link. First of all you can see the elements tab. 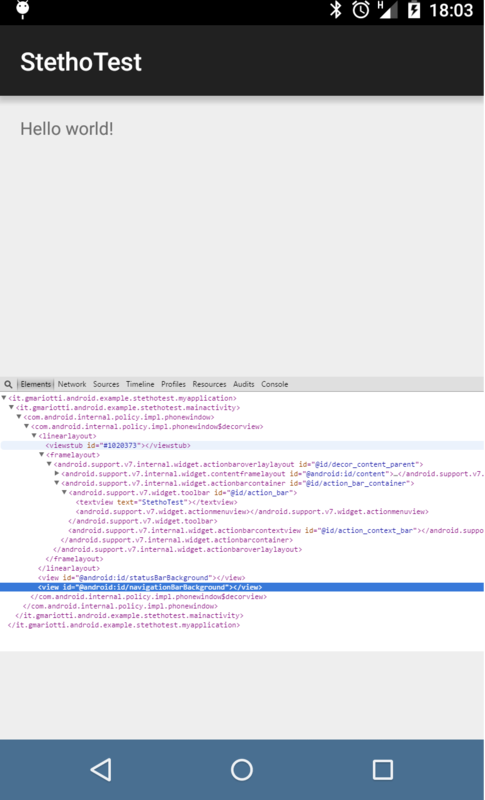 Here a first surprise...clicking on the entry on the tab, the element is highlighted on the device ! If you work with the Chrome Developer Tools, you know it very well. Here you can see the network calls with their data. In my sample app I am setting a simple value in the SharedPreferences. You can check this value in the navigating in the Local Storage entry. Also I use a simple SQLiteOpenHelper to manage a very small database with just a table. You can navigate on the data on the WebSQL entry. Of course it is only a first glance at this tool but it is enough to check the power of this debug tool. 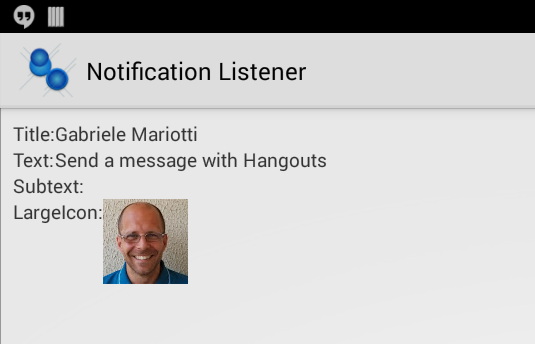 Android 4.3 (API 18) introduced NotificationListenerService. I published a post about it a few months ago. Android 4.4 (API 19) added new features, and now we can have a lot of extra info about a notification (before we need to use reflection to read some info). If you search a simple code to expand and collpse a View with an animation you'll find a lot of example. Almost all of the examples extend Animation class. Instead I would like to use an Animator and its listeners. Where I come from they say I'm discovering the hot water. I know, but it might be useful to someone. As you know the CardView in support library has a different behaviour for API=21 and API &lt 21. If you would like to have an image (full or partial) inside your cardView with Rounded corners it is by default only in Android 5.
cardView.setPreventCornerOverlap(false); to avoid the internal padding in api&lt21.